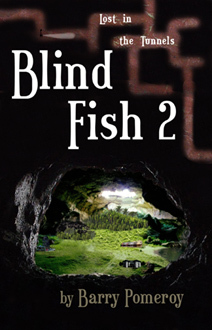 Book One of the Blind Fish Series follows the adventures of those who were trapped below ground when the Bio Park doors closed and blasted rock filled the empty tunnel to the surface. They rapidly rallied their skills, but most of them thought of their exile in terms of months and years rather than generations. Book Two begins in the third year below ground, and tells the story of the Park’s children, who have begun to push against the limits of their tiny world. Their investigation of the mine is only the beginning, however, for their true exploration is intellectual. Not dependent on tedious grant proposals and the vicissitudes of funding agencies, their research begins to take them in directions that would horrify their cousins on the surface. Marc tries to imprint the new generation with his urgency to break out of the Park, but even he is forced to acknowledge that their community is more successful than he would have dreamed. As they tinker with their machines and the building blocks of life, however, he worries that their success comes at a price. Cut off from the above-ground resources as well as its ethical considerations, the children turn their gaze downward, but their willingness to hurdle obstacles terrifies Marc as well as his generation.